The Records Management Center works directly with Webb County Departments. Please know that we do not have access to providing documents to the general public (i.e., deeds, birth or death certificates etc.). Your request should be made directly to the appropriate department (i.e., County Clerk, City of Laredo Vital Statistics office). 1. What is the RMC ? 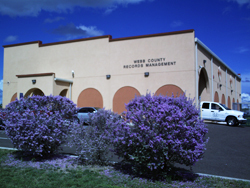 The Webb County Records Management Center is a department that is responsible for the storing and maintaining of county records. 2. Where is the RMC located? The Records Management Center is located at 207 Wilson Road (mailing address: 7117 E. Saunders), across from the Road & Bridge Department on Highway 59. This is one block west from the previous location. 3. What days/times is the RMC open for business? Monday - Friday, 8:00 a.m. - 5:00 p.m. Items can be dropped off (for storing or shredding) at the Receiving Area, or arrangements can be made for pick-up. 4. How can the RMC personnel be reached ? The main telephone number is 718-8536 for the front office. The fax phone number is 718-8001. 5. What departments does the RMC serve, and what types of records are stored at the RMC? The RMC is currently serving 50 Webb County departments, such as District Clerk, Public Defender, C.A.A. and many others, and has an inventory of over 5,000 boxes. The center stores vital records that each department is required to keep for a certain amount of time. The RMC has records that date back to the early 1800's. These historical records are handled with the utmost care. 6. What amount of time are records kept, and how does each department determine this? Each department has adopted a Retention Schedule from the Texas State Library & Archives Commission. The schedule itemizes the various types of records, and designates retention dates for each. This information is included on the Accession List as well as the box label. The required forms for adoption of these schedules and adhering to the Records Management Program in place are available below. Please send the signed originals to the RMC. 7. What schedule should be used when determining Retention Periods & Destruction Dates on our records, and where do I find this information? This information can be found on the Webb County “T” drive, in the Records Management folder, Or, you can go directly to the Texas State Library & Archives Commission website. 8. How can the TSLAC website be found? Open up “Internet Explorer” ( Webb County website appears), type in http://www.tsl.state.tx.us/ in order to go to the TSLAC website. Double click “Our Publications”. Go to “Records Management Publications for State Agencies & Local Governments”. Go to the “Index”, and open “Records Retention Schedule for Local Government” (i.e., Local Schedule GR (42 pages, 111K). Review and/or print, as needed. These schedules are currently being revised. The revised versions are much more user friendly, and can already be considered effective. Currently, they are only available on TSLAC’s website. At a later date, the RMC will add them to their web page. 9. How are records packed for storage? The RMC has very specific instructions in this regard. They coincide with how records are stored at the Center. Standard sized boxes are provided to departments along with instructions on how to label the boxes, and other pertinent information. The required adhesive labels can be purchased at the Central Store. Once a department uses their allotment, additional boxes can be ordered at their own expense. Box order information is available below. 10. Can a department have access to items stored at the RMC? Certainly. The RMC personnel will pull and deliver the record/s for departments when requested. They will retrieve them when the department has completed viewing/copying them. 11. What other services does the RMC provide? The center has the responsibility of destroying records when the retention periods are met. Once approval is obtained from the department, records are shredded, bagged, and sold to a recycling company. Though the proceeds are nominal, we like to think that we are doing our part in the recycling effort. 12. Will the RMC shred papers/records for departments even if they haven't stored them? Yes, with an approved “Shred Only Form” filled out and signed by the authorized department personnel. However, the RMC will be unable to provide a detailed inventory list of the items destroyed since they were not stored at the Center. 13. Does the RMC image/scan records? Some of the long-range goals of the RMC are to provide these services. Currently, the equipment and personnel for these services is not available.